The Flag Registry describes the flag as "Traditional design, registered by County Organization", the organization presumably being the Yorkshire Riding Society. Both the picture and Graham Bartram's comment about the Lancastrian flag confirm that the orientation of the rose favoured by the YRS has been registered, so the rose sits on a point and three of the lines between petals form a 'Y'. My understanding was always that the Yorkshire rose 'sat' on two point not one - therefore Ken Bagnall's flag is upside down. Well, there is certainly some kind of 'urban legend' that a Yorkshire rose rests on one point, so that (some of) the lines between the petals form a letter Y for Yorkshire. I've never been able to trace the origins of this. Certainly, all the roses in the arms of the three Ridings are 'conventional' with the roses resting on two points. However, the roses on the Yorkshire Ridings Society (self-appointed guardians of Yorkshire heritage) do have the roses resting on one point on their home page at http://www.yorkshire-ridings.org.uk. The Yorkshire Rose traditionally rests on one point, two petals, this can be seen in the Coats of arms of some Yorkshire towns e.g., the Castleford coat of arms clearly shows the rose with one point down. Just another one for the "Which way up is the rose" debate - on the M62, at the border of Yorkshire and Lancashire, there are each counties roses welcoming you into their county. The Yorkshire rose sits on one point, the Lancashire one sits on two. What is the correct standing of the Yorkshire rose? Matthew Newbould quotes Castleford's arms (rose on point), yet clearly ignores Knottingley's arms (rose on side) and Doncaster's (one in each position). I have never seen anything which states which is historically most correct and have seen many inconsistent stained glass windows, coats of arms, etc. White and Red roses are nearly always offset when combined in the Tudor rose and the modern Tudor rose is seated on a side (e.g., Queen's Tudor rose on the 20p piece). Hence the contemporary white rose is shown sitting on its point (e.g., Yorkshire tourist board, Yorkshire Regiment) and red rose on its side, agreeing with Richard Webb's M62 report. Just to confuse it, I got this odd picture of a so called "union rose" from Google. 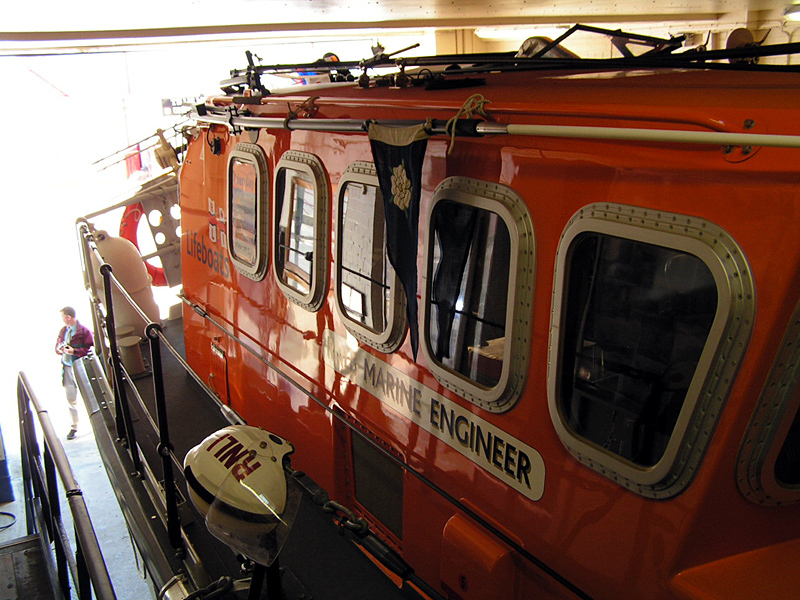 I noticed blue pennants being used on the Bridlington lifeboat. 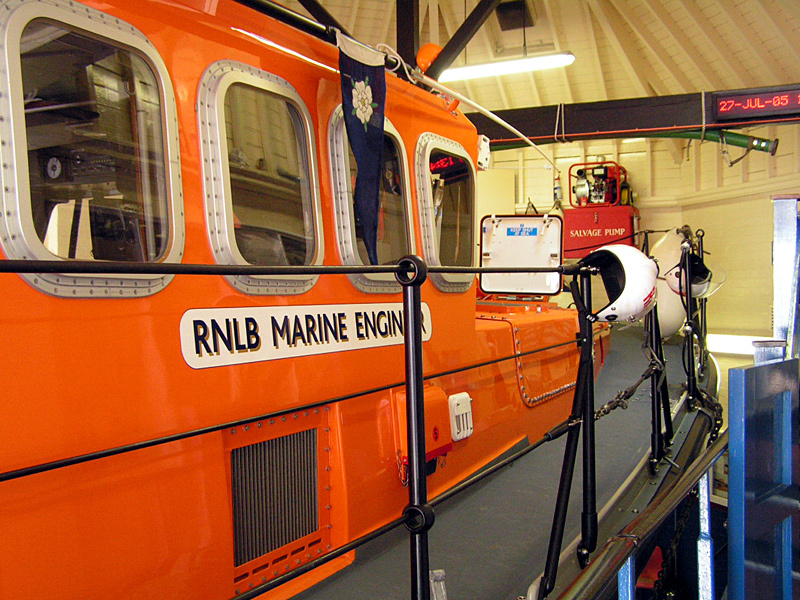 I wondered at the time whether they were connected with the fact that the lifeboat was being launched from a carriage - i.e. pulled across the beach and into the sea by a caterpillar-tracked tractor until it was in sufficient depth of water to float away. The pennants could have been some sort of hazard warning, or an indicator of width during the manoeuvre. However, a quick google has revealed the truth: see this image and this image. They are Yorkshire roses in pennant form! I have had this explained to me by more than one Yorkshireman, that one of the advantages of the flag as they see it is precisely that it can be flown upside down. It would seem to work either way and that it depends from where in Yorkshire you come from according to which way up it is supposed to be. "In the past this has been a dark blue background but more recently a light blue background has become fairly common. According to the College of Heralds, the heraldic rose can be used with a petal at the top or with a sepal at the top. In Yorkshire there is a tradition of using the rose with a petal at the top in the North Riding and the West Riding but with a sepal at the top in the East Riding." The White Rose has been a symbol of Yorkshire since the War of the Roses between Lancaster and York in the 1400's. The Yorkists of the time were represented by the white rose. On August 1st, 1759, soldiers from Yorkshire regiments who had fought in the battle of Minden, in Germany, picked white roses from bushes near to the battlefields as a tribute to their fallen comrades. Since that time the white rose has become the symbol of Yorkshire and is proudly worn by Yorkshiremen and women on Yorkshire Day (August 1). I have been trying to verify the why, when, and how the White Rose was adopted as a county badge for the county of Yorkshire. I note with interest your proposition that it dates from the battle of Minden 1759, can this be verified in any way please. I had started to wonder if it was actually simply a fable as the heraldic links with the Wars of the Roses never was a real contender for all the reasons I am sure you are well aware of. The two houses, Lancaster and York, no longer exist (do they?). Now the question here, as I understand it, is how the family badge of the house of York became the county badge of Yorkshire. To me the reason is obvious; Yorkshire simply adopted it from the family badge. As to the date and manner of the adoption, indeed whether it was an official act with an actual date or a gradual act over time, is an interesting question. The Houses of York and Lancaster still exist in that they are subsumed into the House of Windsor. HM The Queen is Duke of Lancaster and HRH Prince Andrew is Duke of York. The badge of York Herald is a white rose "en soleil" (i.e., with a sunburst behind it). According to the Times Online, it is now legal to fly the flag of Yorkshire [without special planning permission]. The Yorkshire Ridings Society were the prime mover behind this. However, as the extensive media coverage made clear, it was also endorsed by the Lord Mayor of Hull and Admiral of the Humber and other local representatives. In the media coverage, the YRS cited the case of the Ryedale farmer who was summonsed, but not prosecuted, for flying the Yorkshire flag and that this was one of the reasons why this flag needed to be legalised. However, what was not pointed out by them, nor by the many journalists who covered this issue yesterday was that event occurred in 2003 - a full five years ago, so it was hardly a current example. Moreover, that was when the 1992 regulations applied and not the 2007 regulations, which permitted the flying of county flags, so the council concerned were well within their rights to address the issue. Insofar as I am aware, there hasn't been a testing of the 2007 regulations in England. This new flag for the English region of Yorkshire was designed by Michael Faul, Editor of Flagmaster, the journal of the Flag Institute. It shows the cross of St. George, the historic symbol of England, with the vertical band off-centre to the left, in the format adopted by most Scandinavian countries. This reflects the fact that Yorkshire is part of England, but also that it has close ties with Scandinavia, having been settled and ruled by Norwegians and Danes in the eighth and ninth centuries. The white rose is shown on a blazing sun, called "rose-en-soleil" in heraldry, which is the Royal badge of the Royal house of York, the last member of which to rule England was Richard III (1483-1485). The new flag has been adopted by the Campaign for Yorkshire which is campaigning for a Yorkshire parliament. You may be interested to know that the Yorkshire Dialect Society has adopted this flag and uses it as the masthead on its website. The Campaign for Yorkshire has also expressed interest in "officially" adopting it as the flag for the whole of historic Yorkshire (but has not yet actually done so). The centre of the rose is yellow, for the pollen stamens. "South Kirkby and Moorthorpe Town Council designed and commissioned the flag to include the Yorkshire Rose and three coats of arms representing North, East and West Riding – the areas which made up Yorkshire before it was made into four divisions. The flag has the three coats of arms from North, East and West Riding. "We designed it in a Y shape with the Yorkshire rose in the middle. Red, white and blue were chosen as the colours because they represent Britain. I see this as the proper Yorkshire flag – I wouldn't walk behind the other one." The flag shown here is marketed by a camping equipment and adventure travel company, and its status as an official flag of the region is uncertain.